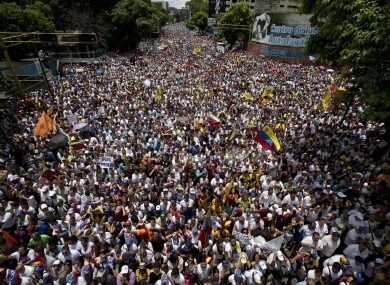 Demonstrators take part in the "taking of Caracas" march in Caracas yesterday. OPPONENTS OF VENEZUELAN President Nicolas Maduro claimed to have mobilized a million demonstrators last night in the biggest rally in decades, vowing weekly mass protests to demand a referendum on ousting him from power. Police deployed in their hundreds to keep anti-government protesters angry at food and medicine shortages apart from Maduro’s supporters, who vowed to defend his “socialist revolution”. The rallies raised fears of violence in the oil-rich South American state, where anti-government protests in 2014 led to clashes with police that left 43 people dead. The leader of the opposition Democratic Unity Roundtable, Jesus Torrealba, told AFP it was the “biggest rally in recent decades” with “between 950,000 and 1.1 million people” taking part. “We either come out to march or we will die of hunger. We are no longer afraid of the government,” said one demonstrator, Ana Gonzalez, 53. The rallies come at a highly volatile time for Venezuela, where a plunge in prices for oil exports has led to shortages, violent crime and outbreaks of looting. “This is a historic march. Today begins a definitive stage in this struggle,” Torrealba said. The people are with you. Maduro estimated his supporters’ turnout at up to 30,000. “Today we have defeated a coup d’etat,” he told the crowd. They have failed once again. The victory is ours. The opposition blames Maduro for the economic crisis and wants a referendum on removing him from power. He has branded the effort a right-wing “coup”. “We are here at the call of our president, to defend the revolution,” said 37-year-old housewife Carolina Aponte at the pro-government rally. The authorities arrested three opposition leaders in the days ahead of the march. Senior opposition figure Henrique Capriles said yesterday that two mayors had also been arrested. Thursday’s marches remained mostly peaceful, finishing in the mid-afternoon, but isolated clashes between demonstrators and security officers did occur, with some violent incidents reported in other cities. After the protest, state security agents fired tear gas against protesters who tried to block the main highway of the city after a group of masked men threw stones at some officers. Opposition leaders and human rights organizations also reported outbreaks of violence in Maracay and San Cristobal. The MUD said in a statement it would hold two further nationwide demonstrations: at electoral offices on 7 September, and a “national mobilization day” on 14 September. The referendum’s timing lies at the heart of the battle. If it takes place before 10 January and Maduro loses, new elections must be held. If he loses in a recall after that date, he would simply hand power to his hand-picked vice president. Maduro said yesterday he had prepared a decree to strip lawmakers in the National Assembly of their immunity. He accused the opposition speaker of the legislature, Henry Ramos Allup, of inciting violence. The opposition “cannot be intimidated,” Ramos retorted. “President Maduro, look at all these people who have poured into the streets of Caracas,” he said. The polling firm Venebarometro says 64% of the electorate would vote against Maduro. A study by another pollster, Datanalisis, indicated eight out of 10 Venezuelans want a change of government. Maduro blames the crisis on the collapse of oil prices and an “economic war” by businesses backed by US “imperialism”. He faces deep public discontent over shortages of basic goods and an inflation rate projected to hit 720% this year. Analysts have warned of a repeat of the deadly 2014 clashes that left numerous opposition leaders in prison. Read: How does an oil-rich country with an economy bigger than New Zealand have food shortages? Email “Hundreds of thousands march against government in Venezuela”. Feedback on “Hundreds of thousands march against government in Venezuela”.